This past January, the Brandeis Executive MBA for Physicians program welcomed the class of 2020. The 29 physicians in the cohort join the program from 16 states (from every U.S. region) and India. The cohort also represents 14 specialties, including surgery, cardiology, pathology, and internal medicine. They are 41% women, and about one third are U.S. students of color. Their average age is 48 with over 15 years on average of post-residency work experience. During their first 10 day in-person residency session, they participated in EMBA orientation, developed their network by meeting and working with each other and the class of 2019, and began their first semester courses. The class of 2020 began their EMBA preparation in December by attending one of two live orientation webinars that walked them through aspects of the program and what to expect during the January residency. They also purchased their course textbooks and started to review the tasks and deliverables ahead of time. Further preparation included completing a self-assessment and inviting colleagues of all organizational levels (supervisors, peers, and direct reports) to complete assessments to build a 360 degree report on the physicians’ leadership styles which was then reviewed during residency with the support of executive and peer coaches. 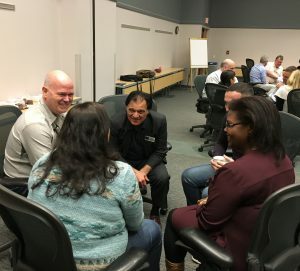 Once they arrived on site in January, they participated in sessions designed to orient students to what it is to be an EMBA participant and to allow the cohort to get to know each other and build strong bonds. In one such session, the students participated in a “Masterclass in Human Creativity and Collaboration” led by Program Director Dr. Jon Chilingerian and a Fortune magazine featured keynote speaker and workshop instructor who brings his perspective as an improviser, actor, writer & director to corporate and business education environments. 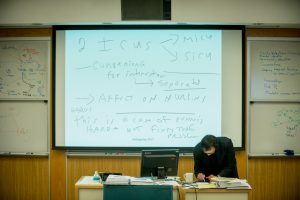 In another session, students were able to practice how to engage as a class in a case discussion – a specific classroom tool used by many faculty to facilitate learning. This January marked the first time that the program has welcomed students from two different cohorts for overlapping residencies. The class of 2019 returned for their third residency as the class of 2020 wrapped up their first residency. Members of the two cohorts were able to meet and network with fellow physicians from their regions and specialties. The program sponsored a cocktail hour mixer to facilitate the building of those relationships. Students have already seen the positive results of the networking. One student from the class of 2020 met with a group of 5 other physicians from her specialty to discuss a difficult work situation. This new structure will strengthen inter-cohort bonds and foster similar connections. By the end of the residency session, the class of 2020 had multiple meetings of each of their first semester courses – Financial Accounting, Healthcare Economics, Leadership and Organizational Behavior, and Operations Management. Those courses now continue through live, virtual webinar sessions through mid-April. The Program staff and faculty are excited to see the class of 2020 when they return in May to start their second semester. 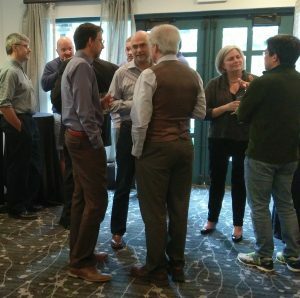 The Executive Team Consulting Project within the Brandeis Executive MBA for Physicians Program (EMBA) is a capstone activity for each student to launch, lead, and work with a team of their colleagues to complete a change initiative that impacts an aspect of their own work in health care. Dr. Evan Lipsitz is an alumnus of the EMBA class of 2017. 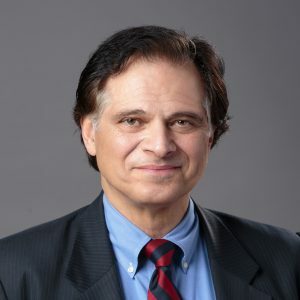 Currently, he is the Chief of the Division of Vascular and Endovascular Surgery and Medical Director of the Noninvasive Vascular Laboratories at the Montefiore Medical Center at the Albert Einstein College of Medicine. During his EMBA, he focused his Executive Team Consulting Project on acquiring and implementing a new system at the vascular laboratory for image management reporting and data storage to replace an outdated system that was used across several of the organization’s inpatient hospital and outpatient sites. The medical center recently finished the implementation of the project, and he joins us to reflect on the experience. How did you choose this specific project? We recognized the need for an enhanced, integrated system more than 10 years ago. About 5 years ago, we went through one complete cycle of product evaluations and replaced the old legacy system with another that was essentially a beta version, and not up to date, didn’t meet our needs, and was not really sustainable. As this became apparent, I chose it as my project with the hope that some of the skills and information I had gotten through the EMBA would help me and the team to make a better business case for the project. It wasn’t that people didn’t recognize the need, it was just that there are so many projects in so many areas that require attention at a large medical center like ours. It became apparent early on in the EMBA that we would cover a variety of subjects each of which would be valuable for approaching this problem. We could then make a case based on business sense and medical necessity, from the point of view of all stakeholders. How has the project evolved since graduation? When I presented my progress on the project at the end of the EMBA program, it had been presented to my organization, but it had not been approved yet. The approval came after graduation. From there, we had to purchase the product, plan the implementation, and work out some of the kinks after the go live. There was still a lot of work to be done around implementation itself and how it was going to work with IT. Much of that work was up front but there were still a lot of things on the backend that we needed to work on. We finished the EMBA in May of 2017, and it was about a year and a half until the system was actually up and running. I consider it done only now that the health system is using it. What was the process of forming your team like? I think we knew who most of the players were, and we involved a lot of people. As with a lot of these projects, it involved IT heavily, as well the people who manage the labs that do the studies. It also involves physicians because we actually have to read the studies. Finally, it involves hospital administration. We needed a comprehensive and invested group of stakeholders to build a strong business case. With this project, the medical need was obvious. It was the business case that was most crucial and which required refinement. What do you think made your project successful? I think the most important thing was making the case from an accounting perspective. I used all the skills from the managerial accounting course. We are able to frame the conversation in new way. Another was using the relational coordination tools we got in the program to build strong teams. Also, working with the team and engaging and encouraging all stakeholders to get some outside the box thinking was helpful. A big stumbling block, at least early on, was that we were going to host the entire system on our servers as the organization was understandably worried about privacy, which would have been a huge expense. Another option was to host the system remotely. After much discussion, everybody came to realize that to make this work, and in anticipation of other upcoming projects, we would need to look to host remotely. It was also apparent that many other hospitals were moving that way as well for similar reasons. So luck and timing played a role as well. The project might not have happened three years ago. The institution deserves a lot of credit for their willingness to move in this direction. As a result, similar projects might have an even easier time looking forward three years from now. How did Brandeis’s EMBA for Physicians program help you along the way? The program was invaluable. I don’t think I could have done it without it. It allowed me to focus on all the important areas other than just medical need. The medical needs were important, and while they seemed obvious, they were not enough. I tried to choose a project that would let me use skills from almost every single class that we had. In some ways, this is not a particularly ingenious project, but I think that the skills and tools needed allowed for really good practical application of all the things that we learned. Practicing these skills will help me do similar projects if needed in the future. What advice would you give to a physician who is considering pursuing an EMBA? This program was great. In this day and age, it gives you a skill set and a perspective that you don’t otherwise get. I think to do it at a time when you have work experience under your belt is very meaningful. No matter what you decide to do with it or how you decide to apply it, it’s knowledge that makes you a better physician in the system where we are subject to so many systematic constraints. Understanding those are really important. Also it’s important in moving forward for physicians to be involved in policy and business because they have boots on the ground. Also, I would add that the program is really a great journey. It’s a lot of fun. It is a lot of work. It’s a big commitment. But I think well worth it. This month, in preparation for the November mid-term elections, we checked in with the professors who teach health policy in the EMBA for Physicians program. 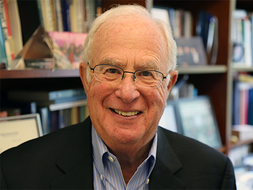 Dr. Stuart Altman, who teaches Issues in National Health Policy, is the Sol C. Chaikin Professor of National Health Policy at The Heller School. He is an economist who has five decades of federal and state health policy experience within government, the private sector, and academia. He currently chairs the Massachusetts Health Policy Commission, which was created in 2012 to monitor health care spending growth. Dr. Michael Doonan, who teaches State Health Policy, is an assistant professor at the Heller School and the Program Director for the Master of Public Policy program. 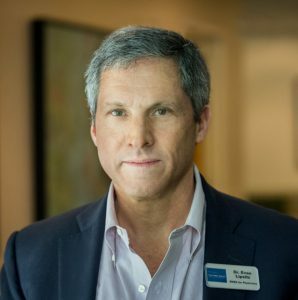 Before coming to Brandeis, he had roles in the Senate, the Clinton Administration’s Health Care Taskforce, and with the Centers for Medicare and Medicaid Services. He is currently the Executive Director of the Massachusetts Health Policy Forum and Director of the Council for Health Care Economics and Policy. Below is their perspective on the importance of health policy for practicing physicians in light of the upcoming election and what physicians can expect to learn in their classes. Health policy is in danger of becoming less informed and effective if physician leaders do not engage. It will be more likely to endanger public health. Managers need to react to the political challenges and adapt organizational structures accordingly. Leaders influence and make change. Physician input is essential to create better systems that more effectively serve patients, organizations, communities, and the nation. Perhaps there was a time when physicians could be more introspective and focus solely on the patient before them or the needs of a particular hospital. This is no longer the case. It is essential to understand how complex political policy change impacts access to care, reimbursement of care, and ultimately the quality of care. The Issues in National Health Policy course provides a historical and contemporary examination of American health care systems programs and policies. This includes Medicare, Medicaid, private insurance, historical efforts at reform, drivers of health care costs, and the history of payment and delivery systems. It helps answer the question of how we created the current system and the more difficult question of where are we heading. The State Health Policy course examines state and intergovernmental relations. It looks at the range of state health care responsibilities including public health, Medicaid, licensure, insurance/health plan regulation, and more. It provides specific tools for engaging with policymakers and directly influencing policy change. This includes interviewing a senior policymaker in your state, drafting op eds and letters to the editor, and writing and presenting legislative testimony on an issue of concern. Taken together these courses open up the black box of the policy process. It is essential for physician leaders to not only manage change but to effect it and lead it. Today policy is being driven far too much by emotion, feeling, and partisan bickering. These need to be replaced by reason and the insight of people who both understand health care and who are committed to improving patient and population health and the efficiency of the overall health care system. Carole Carlson is the Director of the Heller School MBA Program, where she also teaches courses on Strategic Management and Entrepreneurship. Below is the transcript from a short interview, in which she provides insight about what to expect in her two courses in the EMBA for Physicians curriculum, Strategic Management and Health Care Entrepreneurship, and how the topics apply to the needs of a practicing physician. What skills can a physician expect to gain from your classes? For Strategic Management, you gain an ability to diagnose and understand strategic positioning, both for your organization and its competitors, and an ability to understand and align an organization behind a compelling strategy, which often involves change skills as well as strategic skills. More generally, you gain an understanding of the strategy of your current organization and what the implications are for multiple stakeholders. Strategic thinking is fun because you start to look at the world in a different way. It doesn’t matter whether you’re in a restaurant or in a bookstore or on vacation at a hotel; you’re looking around and thinking about the strategy of that organization. I find that really intriguing. It’s a great way to engage with the world. The entrepreneurship course is little bit more nuanced. It covers how to take an idea from the idea stage to implementation and also how to stop wasting time on bad ideas. If you asked a group of physicians, “Who wants to be an entrepreneur?” some would put their hands up. If you asked, “Who knows how to be an entrepreneur?” if people are telling the truth, almost no one would put up a hand. It makes sense to understand that process and whether it’s right or wrong for you. Another thing that I found really resonates with physicians in my classes: There’s a lot of issues around founding and cofounding. People don’t tend to become entrepreneurs solo. Thinking through the dilemmas that can arise around cofounders is actually really valuable because if people are pursuing a strictly or narrowly entrepreneurial path, they are typically not going to do it alone. They need to think through these things in order to be able to make it a successful experience. How can an understanding of both Strategic Management and Health Care Entrepreneurship help physicians in their professional lives? For Strategic Management, in my experience, the physicians that are attracted to our program want to have a broader impact in their organizations. To do that successfully, it is critical to be able to both understand and promote your organization’s strategy. On the entrepreneurship side, I don’t think you can be an effective leader without having some entrepreneurial skills. Even if you’re not interested in starting a venture, your ability to lead like an entrepreneur, look for new opportunities, articulate them, and help the organization see them is essential. People have different mixes of those skills, depending on their professional situation, but I think both are fundamental building blocks to be a more impactful leader in health care today. What can you expect during your classes? In class, you can expect a little bit of up front lecture and then a discussion using the case method, which, if you haven’t done it, is really engaging. It’s an exciting way to think about protagonists in challenging situations, often in health care organizations. For example, this month we are discussing a company that is commercializing a blood substitute product and one that is innovating in portable ultrasound. We also discussed Netflix: their strategy and how they think about effectively managing through turbulent markets. Those are highly interactive discussions that involve the whole class. Sometimes we get a little excited during these discussions, but at the end of the class, the participants have found that they have thought deeply about how that organization might improve. That type of learning is very intense, but there is a really high level of retention and understanding and you get some fantastic insights through the debate and discussion. Finally, the third part of the class is how those insights relate to program participants in their careers and how they might apply the ideas we discussed to their organizations. This blog is the first in our series where we interview professors from the Executive MBA for Physicians program about their courses: both their content and their value for a busy, practicing physician. 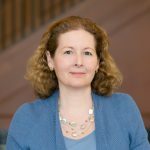 Dr. Brenda Anderson teaches at both The Heller School for Social Policy and Management and the International Business School at Brandeis University. She has also taught at the University of South Wales, Sydney, Northeastern University, and Boston University. Prior to entering academia, Dr. Anderson worked as an auditor for KPMG Peat Marwick and is a Certified Public Accountant. 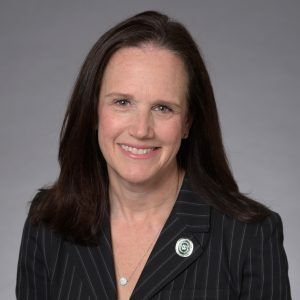 Below is the transcript from a short interview, where Dr. Anderson provides insight about her two courses in the EMBA for Physicians curriculum: Financial Accounting and Managerial Accounting. You teach both Financial Accounting and Managerial Accounting. What are the primary differences between these two courses? I think it best to employ a health care context in answering this question. While not perfect, I believe this analogy from a clinician’s perspective will quickly capture the essence of the difference between the two courses. In the examination of a patient presenting symptoms of a medical condition, the physician might look at the patient’s external appearance and current health status to make some type of initial assessment. The first accounting course in the EMBA curriculum, Financial Accounting, is similar to this context in that it addresses how external parties, such as creditors, investors, and regulatory bodies, process information about an economic entity to assess its financial well-being or “health status.” A standard set of financial statements that includes a balance sheet and an income statement are disseminated to these external decision makers for this purpose. The balance sheet tells a story about what the organization owns (assets) and its obligations (liabilities) as well as providing information on owner contributed resources and accumulated profits (equity). This “story” is reported as of a single date in time and, in sum, describes the entity’s financial position. The income statement or statement of operations conveys information about how the organization has performed over an accounting period. It presents the amount of services or goods delivered and matches this “revenue” against resources used in this delivery to measure performance, or in accounting terms, net earnings. Thus, Financial Accounting is a course focused on external financial reporting. Returning to our patient assessment example, Managerial Accounting would be akin to having the clinician examine diagnostic test results that provide insights as to what is going on internally with the patient so that a medical course of action can be planned going forward. Essentially, Managerial Accounting is a course that focuses on providing decision makers within the organization with information and results of diagnostic tools that will allow them to assess, control and strategically guide the entity. As this course evolves, the focus is on learning about cost identification, overhead allocation, cost behavior, and how the nature of such behavior impacts net earnings or profits. Critical topics such as break-even and target profit analysis, budgeting, outsourcing and long term project evaluation, such as launching a new service line or opening an ASC, are also examined. What skills can a physician expect to gain from your class? Admittedly, I am most certainly biased and steadfast in my beliefs about the critical nature of financial literacy skills. That said, frequent reactions to my class sessions or executive education sessions with physician groups can be summarized as follows. I no longer fear the financial people in my organization. The administrators in my organization are continually talking about margins and overhead allocation. I finally understand their language! I am actually beginning to enjoy learning this stuff but don’t tell anyone. Thank you for teaching us – this is exactly the skillset that I need. Within such comments, you can hear a very genuine, explicit “thirst” for this content. Physicians truly believe acquisition of knowledge in the areas of finance and accounting is tremendously empowering. At the completion of the two courses, you will be able to read, interpret and analyze a standard set of financial statements – balance sheet, income statement and statement of cash flows. You will have an excellent working knowledge of the origins of each line item on these financials because we build our own set of start up financial statements together in class and use this as a learning platform for the remainder of the course. Further, you will be able to understand the nature of product and service cost measurement and behavior, analyze costs using cost/volume/profit analysis, employ a number of cost allocation techniques, analyze a variety of short term business problems (outsourcing, special orders, etc.) using differential cost approaches, evaluate the costs/benefits associated with capital budgeting, and prepare, analyze and interpret budgets and variance analysis reports. When all is said and done, you will have a full and overflowing toolkit from which to draw upon when faced with a wide range of financial analysis and decision tasks within your health care organization. Over the next several months, this blog will collaborate with Executive MBA for Physicians faculty to explore the content of their classes and the subject’s value for a busy, practicing physician. In preparation, below are brief descriptions of the classes in our curriculum, designed for you to scan and read summaries of the classes you are curious about. For more in depth information about specific classes, stay tuned, or reach out to our team at hellerpemba@brandeis.edu. Clinical and Managerial Uncertainty, Data, and Judgment – Studies how people make decisions. When people make decisions, they draw on data, models (mental or formal), and goals that are shaped by their own experiences and the contexts in which they are immersed. Decision making often suffers when situations include uncertainty, dynamically complex problems, high stakes, and time and performance pressures. We will look for connections between how people make decisions and the organizational outcomes we experience. 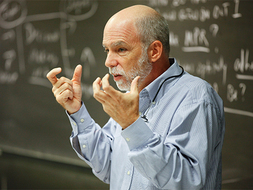 The course introduces the tools of systems thinking for modeling and analyzing organizational policy and strategy. Conflict Resolution by Negotiation – Develops in students an understanding of the nature, advantages, and limitations of negotiations as a conflict resolution tool. Provides a normative and practical framework for pursuing a negotiation strategy as a method of resolving disputes. Provides students with opportunities to apply this knowledge in a variety of simulated negotiation contexts. Finally, exposes students to feedback regarding their negotiation approaches. Corporate Finance I and II – Analyzes the major issues affecting the financial policy of a modern corporation and develops greater depth of financial skills and logical thought processes necessary to formulate and implement business decisions. Reviews foundational theoretical concepts before going on to discuss real-life cases dealing with major issues, such as firm valuation, capital structure and security issuances, payout policies, and corporate restructuring. These issues are central to the investment, financing, and strategic policy decisions facing financial managers. Economic Analysis for Physicians as Managers – Introduces tools of economics that can be used for managerial decision making in the health sector. A framework based on optimization of objectives will enable us to organize information concerning input costs, the market for output, and technology. We will consider the economics of supply and production, consumer demand, and market power and examine health policy initiatives that attempt to change managerial and consumer incentives to change market outcomes. Financial Accounting – Develops a fundamental understanding of financial accounting and reporting issues as they apply to nonprofit and for-profit organizations. Students will acquire skills enabling them to read and analyze the statement of earnings, balance sheet and statement of cash flows. Accounting practices that are unique to nonprofits will be introduced, discussed and differentiated from those practices employed by for profit enterprises. Students will examine financial statements from organizations such as hospitals, large and small non-profits, retailers and manufacturers. The course emphasizes how accounting information, in a variety of organizational settings, can be utilized by decision makers. Health Care Entrepreneurship – Enables students to master the fundamentals of entrepreneurship. It explores how entrepreneurship has become a driving force in the healthcare sector, provides tools for developing and evaluating new ventures, and explores the blurring line between for profit and non-profit social initiatives. The course is designed to provide an intellectual and practical framework for students interested in exercising their entrepreneurial energy to solve problems in healthcare and explores the process of launching a new venture, particularly in the healthcare sector. Healthcare Technology and Information – Discusses the role of science and technology in healthcare settings. Through case studies of technology companies (pharmaceutical, biotech, medical device, and information technology), the class examines how firms manage the creation, development, adoption, and spread of medical innovations in the context of a cost-constrained marketplace. The class uses current academic literature and newspaper articles to discuss how hospitals, insurers, and federal agencies can affect technological progress. Health Law and Ethics – Introduces students to patient care and liability issues within the context of the U.S. healthcare delivery system. The course will cover legal and ethical aspects of: 1.) the provider/patient relationship and liability; 2.) healthcare quality, cost, and access; 3.) relationships between physicians and organizations; 4.) insurance, healthcare delivery systems, regulation, and the Affordable Care Act. Leadership and Organizational Behavior – Focuses on leadership and managing organizations. Uses cases on a variety of organizations to expose students to problems and to improve their effectiveness in analyzing, diagnosing, and leading people in organizations. Students learn organizational concepts, analytic frameworks, and models, and practice their leadership skills in class. Uses case discussions, simulations, role-playing, mini-lecturing, and experimental exercises. Management of Healthcare Organizations – Introduces students to the concepts, theories, and practical problems of managing people in healthcare organizations. Case material is drawn from hospital, HMO, group practice, public health agency, and for-profit company settings. Students gain a better understanding of the range of strategic and operational problems faced by managers, some of the analytic tools to diagnose problems, and the role of leadership (and management) in improving performance. Managerial Accounting – Provides general introduction to the concepts, problems, and issues related to managerial accounting. Managerial accounting predominantly addresses the internal use of economic information regarding the resources used in the process of producing goods and providing services. Fundamental aspects of cost behavior and cost accounting will be discussed, but always from the perspective of the manager who must make decisions rather than the accountant who prepares the information. Marketing – Provides students with an in-depth understanding of the key concepts of marketing and applying them to product and service applications as well as to for-profit and not-for-profit organizations and companies in the health sector. This course is also designed to provide an opportunity for participants collectively to analyze and solve complex marketing problems and to explore, through the study of the marketing of health-related services, the interrelationship between marketing, operations, human resources, information systems, and finance. National Health Policy – An overview of the U.S. healthcare system is followed by a critical analysis of the major issues and trends in the healthcare field. Concentrates on the activities of federal and state governments and the private sector. Also explores likely future issues affecting our health system. Of special concern is the issue of the large number of Americans with no or inadequate health insurance. A related problem is the rising cost of medical care, which results in increases in the number of uninsured. Operations Management – Addresses healthcare operations, which is the management of interconnected processes or systems which facilitate diagnosis, treatment, payment, physician education, and administrative tasks. Uses concepts and tools from management science, decision support, and the science of systems as well as the organization’s strategy to determine the most efficient and optimal methods to support patient care delivery. The course covers several main topics: process analysis, process improvement (which includes patient safety), inventory management, and linear programming. Quality and Performance Measurement in Health Care – A conceptual and analytic framework of the field of quality of healthcare, which includes quality improvement and performance measurement; understanding of the contemporary research and policy initiatives that relate to quality of healthcare; and insights into the ways that quality relates to issues of provider payment, organization of healthcare facilities, and costs of and access to healthcare. By the end, students should have an understanding of the centrality of quality of care issues in contemporary health services research, healthcare policy, and management of healthcare organizations. Relational Coordination Masterclass – Students will learn about relational coordination—and its impact on quality, safety, efficiency, employee well-being, learning, and innovation. Students will learn how to analyze work processes that pose a coordination challenge, mapping out the current state of relational coordination, and assessing areas of strength and areas in need of improvement. Students will learn how to diagnose these structures that weaken or strengthen relational coordination. Moving from analysis to action, students engage with key stakeholders regarding a coordination challenge in their organization. State Health Policy – Examines the role of states in the U.S. healthcare system. Provides an overview of state activities in health, including state responsibilities for managing health programs and institutions. Outlines and explores the policy and legislative processes. States’ efforts to reform their healthcare systems are discussed with special attention to implementation issues, barriers, limits of state action, and prospects for the future of state health reform. Strategic Management – In an increasingly complex and dynamic healthcare environment, physician leaders are constantly called upon to both set strategies for their organizations and ensure effective implementation. This course covers the fundamentals of both strategy development and strategy execution as it applies to healthcare organizations. Using cases from a variety of sectors, we will explore core strategy frameworks and then examine the requirements for effective implementation. The informal connections that participants make with one another throughout Brandeis’s Executive MBA for Physicians program are as important as the formal classroom learning. Participants create and nurture professional connections, which allow them to provide support to one another throughout the program and beyond. Earlier this month, Executive MBA for Physicians alumni gathered back together, almost one year after graduation. Alumni participated in a variety of social, academic, and reflective events, including a simulation and facilitated discussion with Dr. Joel Cutcher-Gershenfeld and a webinar with Dr. Stuart Altman. Alumni also met the current class of physicians, both in the classroom as guest speakers and during an evening reception. We are heartened to see that these strong connections forged during the program continue with our alumni and that new connections are being formed between cohorts. “It was incredibly gratifying to be back on campus with 13 of my classmates almost exactly a year after graduating the Heller EMBA program. The highlight of the event, and it was always the central focus, was the time spent with my classmates sharing ideas, experiences, and new challenges. It is such a unique, insightful, smart, collegial group – I think we all just feel grateful that we have each other to lean on as friends and colleagues. To be back, walking the long pictured hallways, surrounded once again with the sights and smells that were the backdrop of our amazing 16 month journey was icing on the cake. What EMBA reunion would be complete without dedicated time to commune with key faculty – we enjoyed every minute of both sessions. Dr. Gershenfeld, a tremendous new addition to the faculty, was very generous with his time and expertise and managed in a short morning exercise to impart as much insight on negotiation as we gleaned in several sessions during our 16 months. We’re grateful for the gift of his time. and see faculty and staff!! For old times’ sake, classmates shared some wonderful work they are doing – leading (!) sessions on leadership at his hospital in MD; addressing large scale policy issues in VT; and wrestling with the intersection of his company’s program development and hospital HR matters at his clients’ hospitals. Sharing these experiences once again gave us the greatest gift of all from our shared learning and time together – the opportunity to problem solve together and provide one another with mutual support! Heller combines extensive experience providing executive education to physicians, a faculty composed of leading healthcare scholars and practitioners, and on-campus research institutes that continually advance the knowledge, best practices, and future thinking within the field. With Heller recently ranked for the first time among schools of health policy and management, at number eleven, the Executive MBA for Physicians provides MDs, DOs, DMDs and DDSs a healthcare management education with curriculum and classroom engagement refined by experts. The Heller School has been on the forefront of educating future and practicing physicians since 1995. During that time, we have gained extensive experience delivering programs that help physicians improve the quality, efficiency, and accessibility of healthcare. Our MD/MBA program in partnership with Tufts University School of Medicine and our executive education offerings for practicing physicians give our Executive MBA a strong foundation. Heller’s longstanding dual MD/MBA with Tufts University School of Medicine has a curriculum built off of its traditional MBA program but positioned specifically for the context of healthcare. In just 4 years, future physician leaders train not only to be outstanding clinicians, but also to succeed in critical areas of management and leadership that lead to a better understanding of an increasingly complex environment. Heller faculty has used this curriculum as a basis for the Executive MBA and tailors it to better fit the needs of currently practicing physicians. Heller also has numerous executive education programs for practicing physicians in partnership with various medical societies and foundations. For example, The Brandeis Leadership Program in Health Policy and Management is an annual program sponsored by the American College of Surgeons, the Thoracic Surgery Foundation, and 14 other surgical societies. The Heller School-Hanley Center PELI Advanced Executive Leadership Course is a partnership program with Maine’s statewide Physician Executive Leadership Institute (PELI). Heller also has a partnership with the Physicians Foundation, offering healthcare management education to incoming heads of various state medical societies. These programs and others like them honed our Heller faculty’s skills educating practicing physicians. Our faculty includes academics and physicians on the front lines of medical practice and policy who are experienced in educating current and aspiring physician leaders. Heading the faculty is the program’s director, Dr. Jon A. Chilingerian, PhD, a professor at Brandeis and professor of public health and community medicine at Tufts School of Medicine. He is co-author of the book, International Health Care Management. Dr. Chilingerian is joined by senior Brandeis faculty, including Dr. Stuart Altman, PhD, the Sol C. Chaikin Professor of National Health Policy at the Heller School, who serves as chairman of the Health Policy Commission for the Commonwealth of Massachusetts. He has been named one of the “100 Most Powerful People in Healthcare” multiple times by Modern Healthcare magazine. 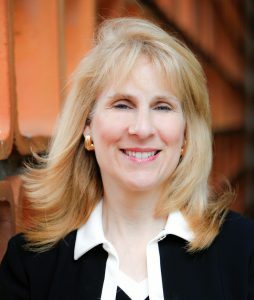 In addition, Dr. Jody Hoffer Gittell, PhD is the founder of the Relational Coordination Research Collaborative, which brings practitioners together to help organizations build relational coordination for high performance. Her research explores how workers, leaders, and customers contribute to quality and efficiency through their coordinated efforts. Faculty bring this, and other, relevant expertise to the EMBA classroom. The Heller School is home to a strong research community that enriches the EMBA’s content. The Schneider Institutes for Health Policy are three nationally regarded research institutes that enable EMBA participants to engage in a rich exchange of ideas with renowned educators, researchers and analysts in the field of healthcare policy development. The Institute for Behavioral Health focuses on the intersection of health, behavior, and systems of care. The Institute on Healthcare Systems is dedicated to providing innovative technical solutions to healthcare stakeholders who are attempting to improve quality, efficiency, and value in healthcare. The Institute for Global Health and Development focuses on the structure and delivery of healthcare, with an emphasis on the Universal Health Coverage agenda. 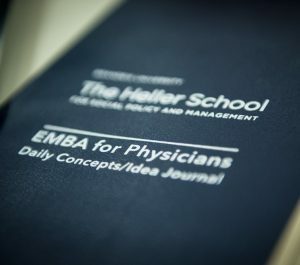 The strong research community at Heller connects the EMBA faculty and students with the latest in health policy and management. The Executive MBA for Physicians program benefits from the Heller faculty’s extensive expertise in both physician education and healthcare management and policy to educate physicians about the new science of medicine and management. Heller’s community fosters leaders who are committed to finding practical solutions to real problems affecting people all over the world. The Executive MBA for Physicians builds on this legacy to educate physicians about how to navigate the ever shifting world of healthcare.